Bought this for my daughter. She loves it and wears it all the time. Very slim and trim even on her skinny wrist. Said she has had so many compliments about it even when she's not at work. Striking just the right balance between delicate and daring, ourfavorite Georgia timepiece redefines style with a super slimleather strap and rosy round dial. This Georgia Mini watch alsofeatures a three hand movement. One of the better watches I have ever owned. Love the color and the leather band. Can be dressy or casual depending on what you are wearing. The watch size is just perfect. Not one of those over sized watches. Very classy. I purchased this watch for my daughter. However, when I received it, it was poorly presented. The instruction manual for the watch didn't fit in the tin Fossil container and the watch was wrapped in plastic. After some maneuvering, I was able to make it more presentable. I thought the band was very skinny and small, luckily my daughter is petite enough that I think it will look ok. Other than that, it is a cute watch. This watch looks like the photo. It is pretty, comfortable, and works well. The watch is very nice but the band might be a bit short. I have to wear it on the last hole. It's kind of small but I love it, it's light and the color is beautiful. 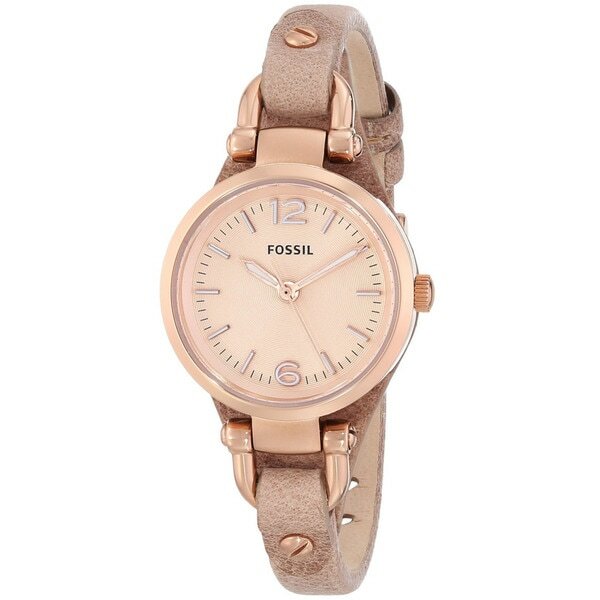 Fossil in my experience has quality. I think my wife will enjoy as it is not "gaudy"